When anyone thinks of Paris, the Eiffel Tower is the first thing that springs to mind. For Venice, it’s gondolas. And when it comes to the Netherlands, most people will think of tulips. We are well known for our flowers, especially our tulips, all over the world. There is one difference when it comes to our national emblem and that of other countries, however. The Eiffel Tower, gondolas and many other ‘emblems’ can be visited throughout the year. We in the Netherlands are, of course, different. You can only come to visit our colourful national emblems for 7 weeks of the year! 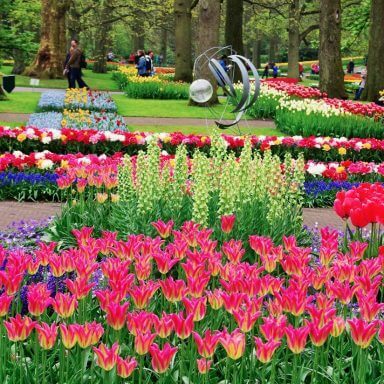 There is no better place on earth to view the beauty of an ocean of flowers than at the Keukenhof. Since I had never been there, and the Keukenhof is a household name in the Netherlands, I decided that it was about time I did. I booked a ticket and after I had seen this incredible spectacle I came to the conclusion that this was an experience I would never have wanted to miss. 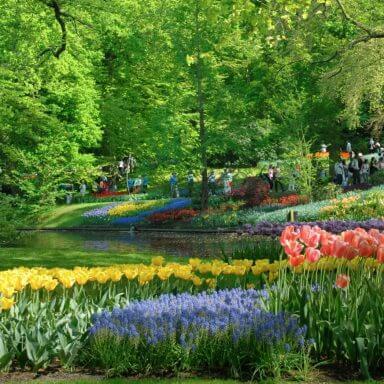 The Keukenhof at Lisse is the largest flower garden in the world. With around seven million bulbs spread over 32 hectares with newly planted displays every season, this is one of the most beautiful attractions the Netherlands has to offer. Legions of tourists disembark onto this breathtaking sea of flowers every April and May. On the colourful flower-fields of the Keukenhof you will be treated to the sight of beautiful spring blooms. On the whole these are tulips, but you will also enjoy a gorgeous array of crocuses, daffodils, hyacinths and lilies. Many of my countrymen and women say this is an attraction never to be missed. I must say that I can only confirm this after my visit. Not only the colour, but also the scent, completely overwhelmed me. Around 1400, the area around Lisse was known as ‘the Kitchen Garden’. This was because this area (the ‘dune’ district) was perfect for raising game and cattle, and for growing herbs and potatoes for the Teylingen castle kitchen (located nearby). In 1642, a castle was built which was given the highly appropriate name of Kasteel de Keukenhof, loosely translated as Kitchen-Court Castle. 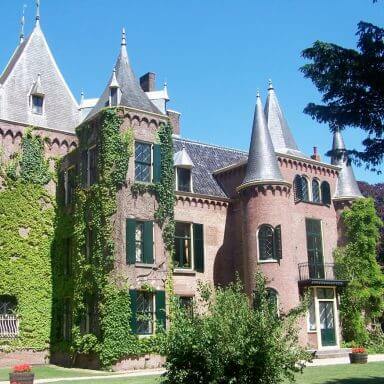 The Keukenhof Park is located on a part of the estate that belongs to this castle. In 1857, the park was redesigned by Zocher & Son landscaping company. 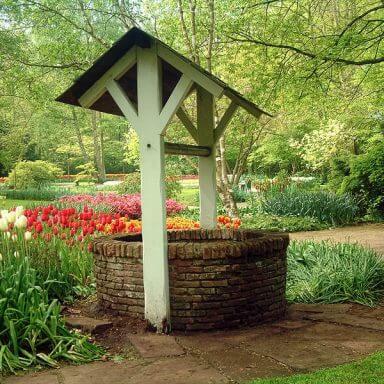 They originally designed the Keukenhof as an ornamental garden for Kasteel de Keukenhof. Later, they also designed the Vondelpark in Amsterdam. In 1949, the northern part of the estate was planted up for a flower exhibition. The opening took place in 1950. In the attractive garden around the pond, with its beautiful vistas and centuries-old beech trees, a million tulips have been blooming ever since. There are now 91 so-called ‘court suppliers’ and about 500 nurseries participating in this exhibition every year. As I have said more than once, the Keukenhof is an absolute must-see. The Keukenhof exhibition has a different theme every year. The 2018 exhibition describes Romance in the form of flowers. After all, romance and flowers are inextricably linked. In the most beautiful spring-time park in the world, walking through an ocean of flowers, romance is in the air. I would not be at all surprisedif this year’s number of Keukenhof wedding party applications breaks all records! What struck me was the fact that there are approximately 15 km of hiking trails here, laid out to show off the most spectacular views of the wonderfully scented bulb gardens and greenhouses. During my walk I saw beautiful displays, ponds and various incredibly decorated pavilions. In the Oranje-Nassau Pavilion a different flower takes centre stage every week. These will include tulips, freesias, gerberas, roses, daffodils, irises and lilies. Flower arranging demonstrations will also be on offer. The Beatrix Pavilion will display orchids, while the Juliana Pavilion will be full of everything there is to know about tulips. You will learn about bulbs that were worth their weight in gold as well as the theft of such treasures and, of course, the story of the black tulip. Tulips named after celebrities will also be part of the show. You will also be given the opportunity to christen your own tulip and get tips and advice from experts. There will be more than 75,000 tulips of more than 600 varieties in the Willem-Alexander Pavilion; at the end of the season the largest lily display in Europe will be hosted here. As well as the flower displays and pavilions, the Keukenhof also has a number of inspirational gardens. It’s in the name: get inspiration for your own garden here – especially those city dwellers amongst us (including me). I was definitely inspired! I had never seen anything like the Keukenhof before! Need inspiration? Then buy your ticket here. Holiday Romance is a garden which offers romantic corners for couples to enjoy. In this tropical garden you can sit under the palm trees and enjoy the sunny colours of the surrounding flowers. Every season Rob Verlinden designs a special feature garden (Rob’s Garden) for the Keukenhof using stock from his own garden. The Rebel Garden is my kind of garden! Anything goes, and it doesn’t matter what kind of reception it receives. Gaudy and bright. The Delftsblauw Garden (Delft Blue) is a Dutch garden with masses of blue and white spring flowers, and here and there a sprinkle of red. The Hipster Garden is a proper man cave, but outdoors. The Tea Garden is full of real ingredients for tasty brews including Swiss mint, lemon balm, chamomile, chocolate mint, anise, verbena and many other goodies. I used this idea at home the moment I got back! For the hundredth time, the Keukenhof is an absolute must! The Keukenhof will be open from 22 March to 13 May 2018. The season ends with ‘Romantiek in Keukenhof’ which includes a classical music festival between the blooms. It would be wise to pre-order your tickets so you do not have to stand in the long queues. They expect it to be very busy this coming season. You can order your tickets here. 654 visitors rated Keukenhof average 4.58 stars out of 5.